The new browser wars on on. More than a decade after Microsoft killed off Netscape with Internet Explorer, competition in the browser market has never been stronger. Just last week, Mozilla released Firefox 3.5, which has now been downloaded nearly 14 million times. Earlier in June, Apple released Safari 4. In March, Microsoft introduced Internet Explorer 8, and Google came out with a speedier beta of its Chrome browser. Some early data is coming in showing relative market share and how fast people are upgrading. If you look at the chart above from Statcounter, it indicates that since March Internet Explorer has lost 11.4 percent market share to other browsers. That is the combined market share of IE8, IE7, and IE6. Certainly IE8 (the light blue line) has been growing strong since its release last March, capturing 16.7 percent of the market as of July 4. Those strong gains make up for most of the drop in IE7’s market share from 49.1 percent in March to 30.1 percent yesterday, indicating that Microsoft is doing a good job of getting existing IE7 users to upgrade at a steady pace. 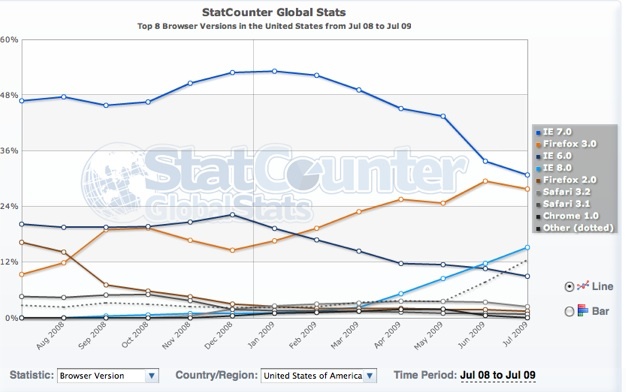 And in mid-June, IE8 finally surpassed IE6, which still stubbornly holds a 7.6 percent share. Add those three up, (IE6+IE7+IE8), however, and IE all together holds only a 54.4 percent market share versus the 65.8 percent combined share in March, 2009. In just over three months, Internet Explorer has seen its overall market share erode by 11.4 percent. Where did that go? It went to Firefox, Safari, and Chrome. Nearly 5 percent of that, or about half, went to Firefox 3.0, which currently has 27.6 percent market share. That doesn’t count last week’s upgrade. See the dotted line just below the light blue IE8 line? That is a combined set of “other” browsers and appears to include Firefox 3.5, Safari 4, and Chrome 2.0. If you look at a 30-day version of that same chart, it shows Safari 4 with 4 percent market share and Chrome with 3 percent market share. It doesn’t yet break out Firefox 3.5, but if you assume that makes up the bulk of the remaining dotted line which jumped to nearly pass IE6 in the past week, you can figure out more or less which browsers are taking share from Microsoft. (I’ve used data from the most recent daily chart in this post, but embedded the monthly chart below which has data as of June 30). As I said, this is early data from one source. Net Applications, another commonly cited source for browser market share, is currently reviewing its June numbers, but I have a feeling they will show similar trends. (This Wikipedia page shows other browser market share sources, most of them haven’t been updated since March). It is difficult to make any firm conclusions at this point, since market share is shifting so rapidly as every major (and minor) browser tries to convince users to upgrade. But we are in the midst of a major upgrade cycle simultaneously across IE, FireFox, and Safari (with the Chrome wild card thrown in). When all is said and done, we might see a major shake-up in market share and almost definitely will see leadership pass from IE7 to another browser. The question is will that be IE8 or Firefox? Whichever one wins, the good news is that IE6 is finally dying.